What is a durable economy? It is one that not only survives but thrives. How is it created, and what does it take to sustain over time? Sustainable Communities provides insight and answers to these questions. 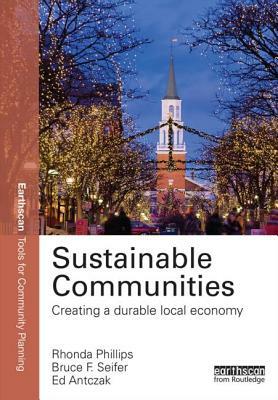 Citing Burlington, Vermont's remarkable rise to award-winning status, this book explores the balance of community planning, social enterprise development, energy and environment, food systems and cultural well-being. Aimed at policymakers, development practitioners, students, and citizens, this book describes which and how multiple influences facilitate the creation of a local, durable and truly sustainable economy. The authors hope to inspire others by sharing this story of what can be done in the name of community economic development. Rhonda Phillips Community well-being is the focus of Rhonda's research and outreach activities. Author/editor of fifteen books on community development and related topics, she offers both practice and academic perspectives on the ever-changing topic of community revitalization. Formerly a Senior Sustainability Scientist with the Global Institute of Sustainability and Professor in the School of Community Resources & Development at Arizona State University, Rhonda serves as Purdue University's inaugural Dean of the Honors College. Bruce Seifer is a consultant with deep experience in economic development. He led the City of Burlington Vermont's Economic Development efforts for three decades, providing technical assistance to 4,000 businesses and numerous non-profits. Bruce frequently speaks at national forums on policy and strategy, city revitalization, and program design and evaluation. Ed Antczak After 20 years in business, Ed joined CEDO's Economic Development Division in 2003 focusing on assisting businesses at all stages of growth, managing a revolving loan fund, and being a member of various development project teams. He currently serves on the steering committees of several national Sustainable Economic Development organizations.